New Delhi, February 15: With the mortal remains of 40 martyred bravehearts of CRPF personnel arrived at the Palam airport in the national capital, Prime Minister Narendra Modi, Union Home Minister Rajnath Singh, Defence Minister Nirmala Sitharaman, and other Union Minister paid their tributes during the wreath-laying ceremony. Congress president Rahul Gandhi too paid the last tribute. Among other prominent leaders and prominent dignitaries who paid last respect to the martyrs include Union Minister Rajyavardhan Singh Rathore, Delhi Chief Minister Arvind Kejriwal, the three defence chiefs – Army, Navy and Air Force, among others. 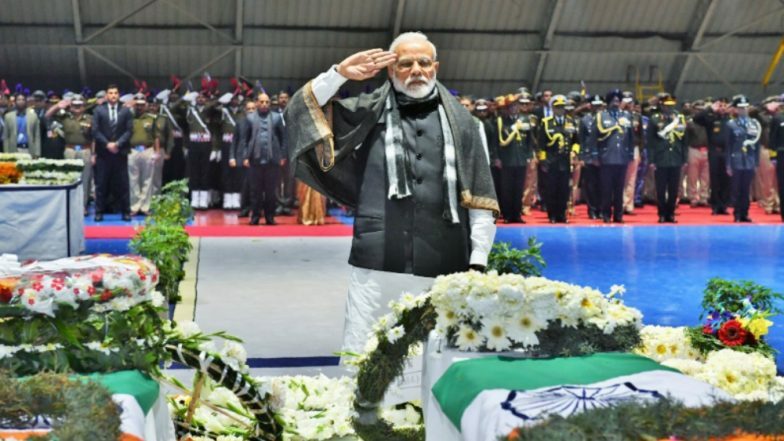 Pulwama Attack: PM Narendra Modi Vows to Give Befitting Reply to JeM Strike, Says 'Army Given Free Hand' . Earlier in the evening, Union Home Minister Rajnath Singh and Jammu and Kashmir DGP Dilbagh Singh on Friday lent a shoulder to mortal remains of a CRPF soldier, a day after the ghastly terror attack on Indian CRPF forces. Singh and Jammu & Kashmir Governor Satya Pal Malik also held a meeting with officials in Srinagar to review security measures in place. After the PM Modi’s CCS meeting on Friday, the EAM has called all the representatives of the elite nations after the coward attack on CRPF convoy in Awantipora area of Pulwama took place by Jaish-e-Mohammad terrorist on Thursday. Following this, representatives of various countries like – Germany, Hungary, Italy, European Union, Canada, Russia, Israel, Australia and Japan – were seen arriving at the MEA office in the national capital. Along with this, representatives of neighbouring countries - Bangladesh, Sri Lanka, Afghanistan and Nepal – also arrived at the national headquarters of the MEA in New Delhi. Earlier, the MEA had called back Indian High Commissioner to Pakistan, Ajay Bisaria, on Friday reportedly to discuss New Delhi's diplomatic strategy in the wake of a terror attack on security forces in Jammu and Kashmir's Pulwama district. Upon his return to India, Ajay Bisaria is likely to meet External Affairs Minister Sushma Swaraj and Foreign Secretary Vijay Gokhle. Pulwama Attack Fallout: Ajay Bisaria, Indian High Commissioner to Pakistan, Called Back. After the attacks on convoy of 76th Battalion of the CRPF on the Srinagar-Jammu highway in Awantipora area of Pulwama district of Jammu and Kashmir on Thursday, the Union Ministry of External Affairs on Thursday appealed to members of international community to support the proposal to list terrorists, including JeM Chief, as a designated terrorist under 1267 Sanctions Committee of UN Security Council. It also sought the members to ban the terror organisations operating from territories controlled by Pakistan. Also, briefing the details of the CCS meeting earlier in the day, Union Finance Minister Arun Jaitley had said, while addressing the media, “The Most Favoured Nation status which was granted to Pakistan, stands withdrawn.” Jaitley said India will intensify its diplomatic efforts to corner Pakistan on the international level. Pulwama Terror Attack: Rajnath Singh Becomes a Pallbearer for One of the Martyred Jawans in Budgam (Watch Video). At least 40 soldiers have been martyred and over a dozen seriously injured after a truck laden with explosives rammed into a CRPF vehicle part of the security forces convoy on Thursday in Kashmir's Pulwama district, Awantipora area.